Looking for a stylish way to improve drainage and reduce soil erosion? O’Grady’s Landscape has just the solution you need! We offer retaining wall design and construction services to homeowners throughout Northern Virginia and can help you protect your property while enhancing the aesthetic of your landscape. So if you’re looking for a local landscaper with experience and dedication to providing a high level of customer support, you’ve come to the right place. O’Grady’s Landscape can build custom retaining walls for clients in Great Falls, Vienna, McLean, the City of Falls Church, and North Arlington. Call us at 703-533-5001 to schedule a consultation today! As your one-stop-shop for landscaping in Northern Virginia, O’Grady’s Landscape has all your retaining wall design needs covered and can help you find the best type of stone to bring the final design to life. Looking for help with master planning to improve drainage, as well as overall functionality and appearance of your landscape? We can help with that too! Check out our landscape design and hardscape services to see how we can improve the look and feel of your property or give us a call to receive personalized recommendations from our highly trained, experienced landscapers. From simple to extravagant, the specialists at O’Grady’s Landscape can help you accomplish all your landscaping dreams and keep your favorite hardscapes protected from any storm with our retaining wall services. 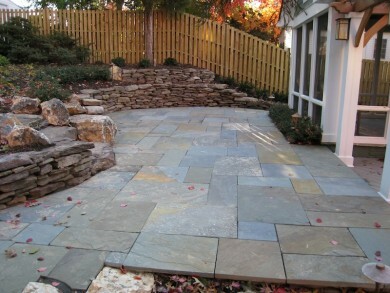 Are you ready to start installing a stylish and efficient retaining wall in Northern Virginia? You’ve come to the right place! At O’Grady’s Landscape, we can help you create and maintain a picture-perfect outdoor space with drainage systems that are both unique and functional, like our state-of-the-art retaining walls. Let us transform your home with the practical, one-of-a-kind design you’ve always wanted—call us at 703-533-5001 to schedule a consultation today!